Whether you are eager to backup your entire DVD collection to NAS for safe keeping or digitize your DVD discs to MP4 or other videos with file size well optimized for more storage in your Synology and QNAP NAS, you are going to get the best answer in the post. "How to rip my DVD collection to NAS? I have a stack of DVD disks in a local store and need to rip them into digital formats to store on my NAS to protect the originals, and make them far easier to view on my TV, iPad, iPhone." To store hundreds of DVD discs all in one single gadget without any storage space anxiety, ripping DVD to hard drive, USB or Cloud service won't pique your interest any more, since there's a much perfect solution for you - copy DVD to NAS. Shifting to rip DVDs to NAS drive means you, your family members and even colleagues get the freedom and convenience to access DVD movies on your iPhone, TV, iPad, computer, game consoles, etc anytime anywhere. Plus, you can backup DVDs to NAS without any safety issue, file corruption, or storage space limits, which commonly occur in cloud data storage and hard drive. And the whole process is pretty easy. Just download the right DVD to NAS ripper > digitalize DVD to best format for NAS drive > transfer DVD movies to NAS. The "right" means good quality, fast DVD disc to NAS converting speed, and don't forget the ability to bypass DVD encryption which really matters most since almost all DVDs you rent or bought come with DRM protection. Anyway, you won't go wrong with MacX DVD Ripper Pro, a top-rated DVD ripper recommended by tech giants like Macworld. • It can 1:1 copy DVD to ISO, MPEG2 and MKV with subtitles and audio tracks for safe storage on NAS drive. • Dgitalize DVD to NAS-friendly MP4 H.264 or other formats like MOV, HEVC, AVI, etc for convenient streaming on DLNA/UPnP enabled iPhone, iPad, Android, Xbox, PS4, computer and TV. • With unique level-3 hardware acceleration, it can convert physical DVD disc at 5x faster than other DVD ripping programs, leaving more CPU available at the same time for other tasks. Step 1: Free download the DVD ripper according to your OS platform. Then run it. Insert DVD, click "DVD" icon at the top-left corner and select DVD to be converted. Step 2: Select an output format and click "Done". You are offered a wide range of preset profiles for iPhone, Android, TV, gaming console, as well as digital video formats covering MP4, AVI, MOV, MKV, together with 4 DVD backup modes - main title/full title copy, backup DVD to MKV, copy DVD to ISO image. Remember to transfer DVD to your media server as per your needs. Step 3: Click "RUN" to process the DVD data to NAS ripping. The speed also depends on your personal computer hardware, like CPU, RAM, DVD-ROM reading speed, HDD write speed etc. 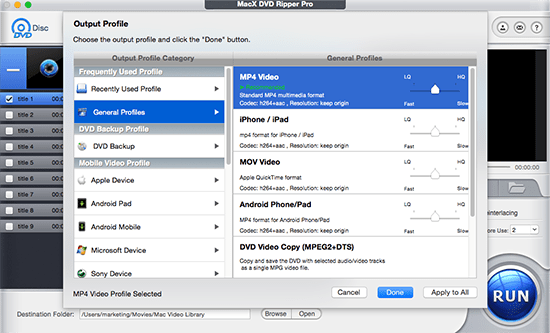 The reliable DVD ripper for Mac/Win gives plenty many other bonus features in DVD editing and compressing, allowing you to trim, crop, add subtitles/watermark, adjust DVD video audio parameters, compress DVD file size with high compression ratio and good quality, to name a few. • If you focus on 1:1 backup and care nothing about size when storing DVD movies digitally on NAS, you can think of the DVD backup modes offered by MacXDVD. You can copy DVD to ISO image and MPEG2. The movie content, and extras like video/audio tracks, chapters, subtitles, menus etc are kept at your will and there is no quality loss at all. • If high quality video output is appealing for you, you can backup DVD movie titles to NAS with MKV format. As a HD video format, MKV gives great video image quality identical to the original one and is widely accepted by media servers and players. But you will sacrifice more space to store MKV file. • In the consideration of good quality and size balance, you can rip DVDs to MP4 H.264 format and then store the movies in WD My Cloud or Synology NAS. The files in digital MP4 H.264 reach good compression and widest compatibility with mobile devices, TVs, computers and gaming systems. That means you can stream the movies from the NAS to the DLNA/UPnP compatible gadgets and watch them without error. After the DVD to NAS conversion on your computer, you can upload DVD movies to NAS following the tutorial below. Many NAS providers offer easy-to-use file manage tool for users to upload files or folders from computer to NAS in various methods. Take Synology as an example. You can transfer DVD to Synology NAS using File Station, a file manager from Synology. 1. Download File Station on Synology. 2. Go to the left panel of the program and choose the local files/folders. 3. Just drag and drop the converted DVD files on your computer and start to backup DVD to NAS drive. The speed is theoretically much faster than that of uploading file to Cloud. Ripping DVD to a NAS drive has obvious advantages over copying DVD to USB, Cloud, or hard drive. • To play movies on USB/hard drive, you have to plug in USB here and there. • What's more, USB flash drive and hard drive are easily damaged and get lost. • How about storing and uploading DVDs to Cloud like iCloud, Dropbox for easier viewing on iPhone iPad Android computer? Many blames involve in the safety issue and monthly charges. All the embarrassments are gone with a NAS. NAS is your private cloud drive and media server with the ability to store thousands of DVD contents, meantime, it has no limits on when and where you can access your DVD collections on NAS as storage like XBMC and Boxee do via iPhone, iPad, Android devices, game consoles, TVs. • But you should know NAS has limits before you decide to copy DVD collections to NAS. A NAS device is not cheap and a bit complicated to start with for non tech-savvy. • And some contents, if saved in unfriendly formats, mightbe incompatible with the streamers. • Even though it's easy to rip DVD to NAS media server, it's hard to manage the ripped DVD files if without any third party help. Users are advised to setup Plex or Roku media server to reduce bandwidth usage, or manage, transcode and play DVD movies on NAS. Backup/rip DVD to MP4 H.264, MKV, etc for storing on NAS.